Chances are you aren’t going to be able to walk into an art museum and walk out with a Picasso – legally, at least – but at the Branson Auto & Farm Museum collectors can drive off with the auto of their dreams. A popular fixture since 2009, the Branson Auto & Farm Museum houses an impressive selection of more than a hundred vehicles and an assortment of tractors and implements. The inventory at the museum changes from time to time so that visitors can always enjoy something new to see but the choices for collectors and casual observers always remain top notch. Recently, the museum housed such gems as a black 1958 Cadillac Biarritz, which boasts a 335-horsepower engine; a 1942 Harley-Davidson motorcycle that’s eye-catching and for sale at $49,500; and the more modern 2004 Ferrari 360 Spider F1. On the farming side, you’ll see vintage models of Allis-Chalmers, Oliver, John Deere and McCormick Farmall tractors and machinery. In 2012, the museum was one of 600 buildings damaged by a tornado that hit Branson. After getting an overhaul during 2013-14, the Branson Auto & Farm Museum re-opened with its current name, a nod to the vehicles, antique tractors and farm implements exhibited inside. The 78,000 square foot museum has two large showrooms – one featuring cars and trucks of all different periods and the other featuring antique farm equipment. 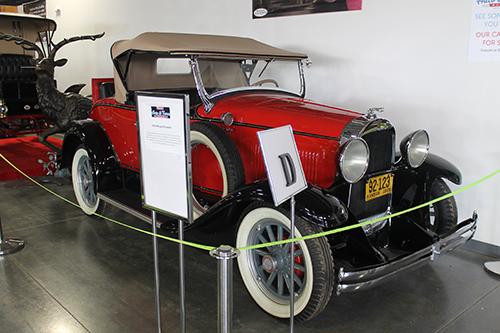 Today, auto enthusiasts and collectors alike find many reasons to explore the museum. With so many stunning vehicles on display, there are also plenty of great photo opportunities. The Branson Auto & Farm Museum is open daily, 9 a.m.-8 p.m. and is located at 1335 W. Highway 76. You can browse the inventory of vehicles and other items for sale on their website. For other interesting automobiles, check out the Celebrity Car Museum which features the Batmobile and cars from movies such as Dumb & Dumber, Transformers, The Fast and Furious and more!